Should I store my coins on exchanges or withdraw them? So you want to store your crypto without having to buy a Ledger. Or you’re worried about being hacked so you steer clear of mobile and online solutions. What is an affordable, low-tech and secure way to stash your coin? Enter the paper wallet — an old school way to safely HODL your coins without a lot of hassle. How do paper wallets work? Believe it or not, paper wallets, also known as cold storage, are generally considered the most secure way to store your cryptocurrency. We use the term “store” but in fact, your coins never leave the blockchain. Paper wallets do not store funds like regular fiat wallets. Instead, a crypto wallet securely holds the combination of your public and private keys, which gives you access to your funds on the blockchain and enables you to send and receive those funds. With a paper wallet you print out your public and private key combination in QR format and this cannot be accessed by hackers or third parties as they are not stored on a device. Simply scan your QR code later when it is time to ‘sweep’ your funds ready for use. How do you generate the keys for your wallet? There are programs available that will randomly generate a public and private key for your wallet offline. After creating your keys the program destroys any trace of your details. Similar to a savings account for fiat, a paper wallet is generally used for long-term storage of your cryptocurrency — coins you’re HODLing or don’t plan to access frequently. For coins you intend to spend in the short term or trade, you may want to stick with a “hot” wallet — one that is connected to the internet. 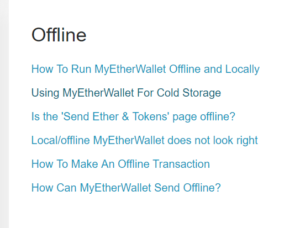 A cold, or paper wallet, is completely offline, therefore, it is not subject to malware or keyloggers and you won’t have trouble accessing your funds if your hardware device breaks. 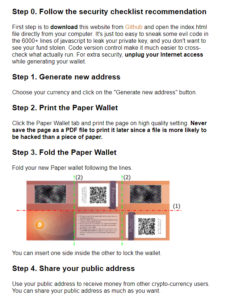 Below are step-by-step instructions on how to create a paper wallet. The first step is to run your malware & virus protection software and make sure your device is clean. Ideally, use a brand-new PC. Next, visit WalletGenerator and follow the instructions. You will find a secure link to GitHub and from there you can download the Zipfile for the wallet generator. Do not download this file from anywhere else. You will see these instructions. We have added some extra details below to help you. Open the ‘index’ file and chose the browser you want to use. Once the address has generated, check that the currency type is correct and print your paper wallet on high-quality paper. It is best to make a few copies and laminate them and keep in several secure places, such as a bank deposit box. NEVER store the details on your device or change the format to PDF as this leaves a trace on your device, print it as is. You can share your public address. NEVER give anyone your *private key*. It is very important to learn the difference, you can now send your currency to this new address. As with any address, it is good practice to send a small amount first, then check the blockchain before sending the rest. You will be able to use the blockchain explorer to check your balance in the usual way and send funds as you like to the PUBLIC address you have just created to add to the balance. Again, the first step is to run your malware & virus protection software and make sure your device is clean. As before, download this zip file into your computer and open the index.html file. Disconnect your computer from the internet. You can create the wallet directly from MEW without downloading the zip file, but this much more secure. Create a strong password, consider using a phrase or sentence. Your private key has now been generated. Remember not to share this information with anyone. So, you put some funds in a paper wallet. Now its two years later and you have decided to buy a new car or go on a luxury holiday. How do you spend the funds being held offline in this way? We use the term “sweep” when referring to the process of accessing funds in your wallet. Please keep in mind that it’s important to sweep the entire balance. This means that you should empty your paper wallet every time and send the whole balance to a new address that you control. DO NOT try to spend funds directly from your paper wallet. You may want to create several smaller value paper wallets for long-term storage so that you don’t have to move your whole balance several times. 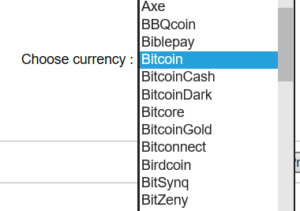 You will need to import your private key to a wallet for the currency it is holding, which will need to be downloaded from the currency website. For example, for Ethereum you would likely use a MEW wallet via www.myetherwallet.com and import your private key. This will be slightly different for each currency type. It’s a good idea before sending over all your funds to practice with a small amount. Send some coins to your offline address and then sweep it back to get comfortable with the process before moving over a large amount. Using a paper wallet is different from other types of crypto wallets, but after going through the process you will get the hang of it. Paper wallets are a safe and free way to store your crypto so they are definitely worth trying out.